The Hotel Frederick, Boonville, MO, built in 1905. Still open, it has been restored to what it was in 1905. The wooden floors are original, as is the old elevator and the much of the decor. They have a special Bed and Breakfast deal for bicyclists since this is on the Katy Trail. This passenger depot is the only remaining (out of 4) depots with the southwest architectural stying. The other 3 depots were in Oklahoma. Which makes me ask the question, "Why does the Missouri-Kansas-Texas Railway not mention Oklahoma, even though you have to go through Oklahoma to get from Kansas to Texas?" I know it is trivia, but the questions bugs me. I think it might be because the M-K-T railway was built in the 1870s and Oklahoma did not become a state until 1907. Just a guess. If anyone has a better answer I would love to know it. Another shot of the southwest styling. The bridge in the background is the old M-K-T bridge across the Missouri River. The bridge has not been used since the M-K-T shut down. The menu is on a white board. After seating you, they bring the board for you to study. After taking your order they move the board to the most current table seated. Each dish was unusual, but the food was a good today as I remember from 2 years ago. Rellene and I had the Wild Rice/Apple Pancakes over Spinach, and Max had the Kaiser Roll. When Max gave his order, he teased the waitress and mentioned he wanted the 'meat and potatoes'. She said, "It normally doesn't come with potatoes, only chips, but who knows." Well, when she brought out his sandwich it had roasted red potatoes instead of the chips. Now what restaurant could go wrong when it has a kayak hanging from the ceiling. The old depot is now a rest stop for the bike trail. I had never seen a bicycle built for two like this one. On our way back to Sedalia, we detoured through California. And the sign said it only had a population of 4,005. Yes, it was California, MO, not the state. But it did have this wonderful old home. Thought it might be a Bed and Breakfast, or it might have some sign indicating who built it, and how old it was, etc., etc., but no luck. Nada. I think today it is just a private residence. Sure would like to know the history of this house. Memorial Day found us out at the Moose Rec Center, 20 acres about 5 miles from town. Not only does it have a covered pavillion, but a stocked, private lake to fish in. There were burgers, hot dogs, chicken and all the fixin's along with games while waiting for the food. Maybe the thieves won't know this sign is for them. Another depot on the M-K-T line in the town of Pleasant Hill, MO. Built in 1903, it is now a visitor center, museum and several small shops. On the way back from Kansas City we spotted this B-2 Bomber flying overhead. We decided to do some sightseeing in the area, so we headed south to Warsaw. Our first stop was the Harry S. Truman Dam and Power Plant. Started in 1964, it wasn't completed until almost 10 years later. It got sidetracked due to lack of funding during the Vietnam War. Once it was complete it took only 21 days for the lake to fill. One of the few suspended bridges still left in the area. This bridge spans part of Lake of the Ozarks, just downstream from Truman Dam and Lake Truman. This part of Lake of the Ozarks was once the original streambed of the Osage River. This suspended bridge was originally built in 1904, destroyed by a tornado in 1924, rebuilt in 1928 and dedicated as a historic site and walking bridge in 1974. It has 720 strands of cable. The restaurant next to the bridge where we had lunch. When we arrived and got out of the car, the tornado sirens were just going off. We had spent the last hour at the Truman Lake and Dam Visitor Center waiting for the tornado watch to end. A tornado was spotted just a few miles down the road, but luckily it never touched down. After lunch we headed towards Clinton, but passed through Tightwad on the way. The site of the MKT (Katy) railroad depot, built in the late 1800s, destroyed by fire and rebuilt, then remodeled in 1944. It is now the visitor center and chamber of commerce. Clinton is the start of the Katy Trail. After Union Pacific merged with the MKT Railway, it no longer used the MKT line from Clinton to St. Charles and they donated the property to the state where it is now a multi-use trail for bikers, hikers and equistrians. 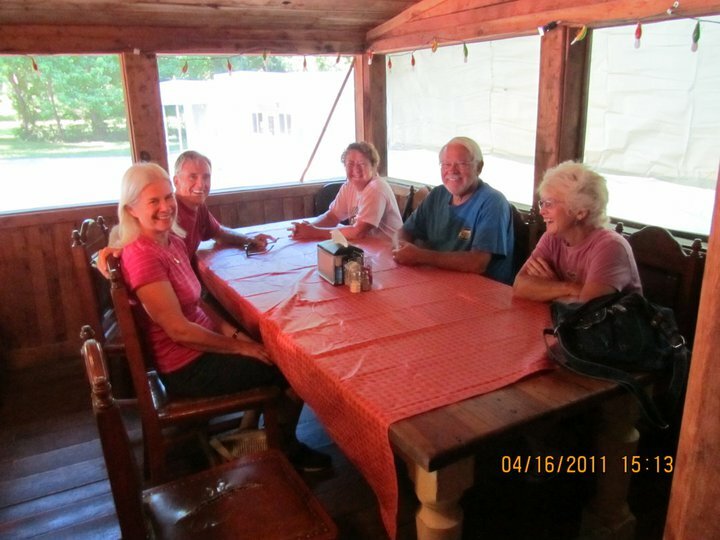 You can go the entire 244 miles, staying at bed and breakfasts along the way. I was hoping to ride some of the trail in this area, but the weather isn't cooperating. I guess this is a reason to come back! This was like going back in time. This station looked just like it would have back in the 1950s and the name was "Time Flies, D-X, Mid-Continent Petroleum, established 1930"
But then we returned to Sedalia, where a tornado destroyed parts of the town while we were out sightseeing. Luckily our motorhomes were on the other side of town and there was no damage for us, but not everyone was so lucky as you will see in the following shots. Notice the motorhome in the background. There was a restaurant next to the gas station. Maybe they had stopped for lunch? The tornado hit at 12:30. I think he's gonna need a new truck. This car lot lost every car on its lot to damage. Probably 50 at least were destroyed. What you see was once an RV trailer. I just heard on the news the weather service rated this tornado as an EF2. Lots of damage on the south side of town, and there were people injured, but no deaths as of this evening. In the Moose Lodge tonight, we heard several members lost their homes in the tornado. And my family went through tornados in Oklahoma City yesterday. Whew! We were going to stay here in Sedalia for the Scott Joplin Ragtime Festival, but the weather has us rethinking the situation. I guess we will see what the weather brings over the next few days. And guess what, it's raining again. Hopefully no more storms tonight. Table Rock Lake is so high, some of the campgrounds and picnic areas are under water. Went up to Springfield one day and visited Bass Pro Shops. This is the ceiling. It's supposed to be what a fish see when he looks up at the top of the water from underneath. Weird View. We happened to be there when they fed the alligator. Here he is eating a rat. The entire store has scenes like this, full of full scale outdoor scenes with stuffed animals. They also have several live aquariums too. Wilson Creek Battlefield is only a few miles outside of Springfield. This is the John Ray home, which served as a battlefield hospital during the battle. His family was in the cellar during the battle. John Ray was pro-union, even though he owned slaves. I learned Missouri had more skirmishes and battles than any other state during the Civil War. Harrison, AR, hosted the Crawdad Festival. Part of the festivities was a car show. Isn't that a cute dog? FedEx had Denny Hamlin's car on display. We were here 2 years ago and enjoyed the festivities, so we came back to check it out again. I didn't know they had gorilla's in Arkansas! The best part of the day was the cardboard kayak/canoe races. They have to build a boat using only cardboard, duct tape and paint. This year there were 3 teams entered. The Hillcrest Home boat was the clear winner this year. When they finally came back to land there was not a drop of water in their boat. These guys folded shortly after entering the water. Our time here is drawing to a close and onward we will go. Sedalia, here we come. I'm back at Tyler Bend Campground on the Buffalo River. This was always a stop on NARKSMO, a WIN caravan from several years ago. Nice campground which is never busy, right on the river. 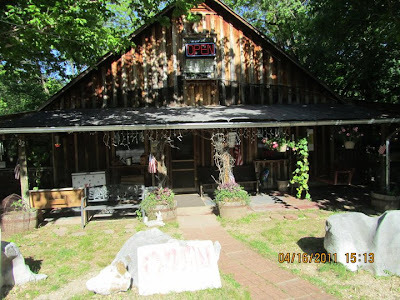 Several hiking paths, a visitor center and an old homestead. Just a short kayak trip, only 5.5 miles. Put in here at the campground and floated down to Gilbert. This eagle was posing for us on the limb of a dead tree. Lots of turtles were out enjoying the sunshine. Gilbert is just a small town, with a general store, post office, restaurant and a few cabins and bed and breakfasts, as well as a river outfitter. The general store still has the old post office boxes, even though there is a new post office down the street. This is the headquarters for the river outfitters and they sell some camping supplies, a few food items and of course, t-shirts. A local man from Gilbert takes his dog with him. 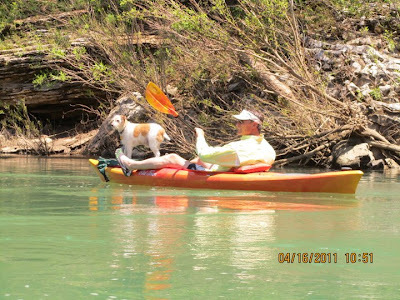 Max asked if he could get his dog to teach Fancy, my dog, how to be still enough to go kayaking with us. Not.... We visited some with this guy and he kayaks year round, even in December, January and February at least once each month, and when possible, several times a week. We stopped at a COE park on the Arkasas River, outside Morrilton, AR. Nearby is Petit Jean State Park. Built in 1928, this was the administration building for a YMCA camp until it burnt in 1940. Notice the unusual designs on the sandstone blocks. This is the grave of Petit Jean or Little John in French. Petit Jean was engaged to a relative of the King of France, but he was sent by the King to America to explore. Jean wanted to go but he refused saying it was too dangerous. So Jean disguised herself as a cabin boy and hired on the same ship as her fiancee. No, not even her fiancee, recognized her and she spent the next year sailing and exploring. They ended up here in what is now Arkansas after navigating the river. As they were preparing to leave to return to France, Jean got ill. Only then was her real identity discovered. She asked to be taken back to this hill to die, as she had fallen in love with this country. Years later this grave was discovered and it is believed to be the grave of Petit Jean. Yes, it is May 14. But it was cold. The wind was blowing about 20 mph and the temps were in the low 60s. Less than a week ago it was in the mid nighties. This bridge was built in the 1930 by the CCC. It creates a beautiful frame for the waterfall behind. From this overlook you can see, on the left side, a small waterfall. And down at the bottom are people. This is Cedar Falls, which cascades 90 feet down the hill into a pool of water. These are turtle rocks. They look like a turtle shell. There are hundreds of these formations in this area. Fance was enjoying the sunshine, hiding in the tall grass and wildflowers. We hiked down to Cedar Falls. The path down and back looked like this most of the way. We also hiked Seven Hollows Trail. All the signs in this park were as bright and colorful as this one. This was a natural bridge formation. Here we are under the natural bridge, but somehow Tom managed to hide behind some of us and you can't see him. There were several varieties of wildflowers. as well as through some beautiful forests. It was much larger once you went in. It also had a back door. It took us 3 hours to hike only 5 miles, but that was because we kept stopping to explore. Tomorrow we are heading north to Tyler Bend Campground on the Buffalo River.